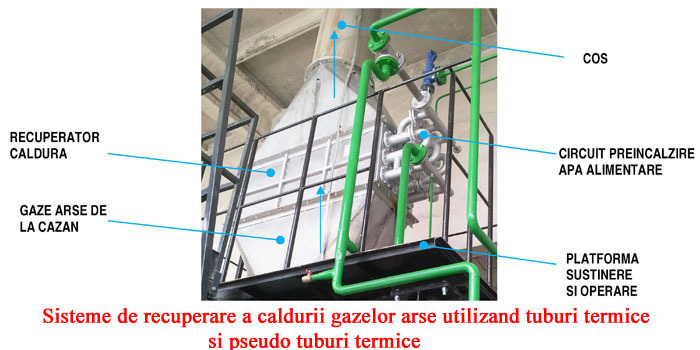 b) Adaptarea la conditiile reale de functionare ale cazanului, caracterizate printr-o variatie continua si ampla a arametrilor sai. Our company Turboexpert SRL is involved in research and development of heat recovery systems and equipment. We design equipment, we install it ( turn key projects) and we offer consulting and technical assistance. One of our area of expertise is energy recovery, obtaining significant fuel economies and minimizing environmental impacts. We recover waste heat, especially from flue gases released to atmosphere at high temperature 150 to 400degrees C. Such applications are steam boilers, furnaces, internal engines. We also recover steam under pressure for producing electricity (CHP). Such applications are industrial boilers over 20t/hr steam capacity and delivery pressure over 16 bar. For waste heat recovery Turboexpert SRL has designed an original recuperator. It consist of a modular solution that can work in economizer or condensation mode, based on the flue gas temperature and it's dew point. The major advantage of our recuperator is that have a very competitive price, can be located in restrained locations, can operate under different thermal regimes, and require a very low maintenance. Return on investment can be obtained in a very short period , 5 to 8 months of operation. Economical efficency of our recuperators is very high, The investment is recovered overall for heat recovery systems in 5-8 months of nominal operation .